Using compression correctly is the second most important thing to do after EQ when you need to manipulate audio. However, although compression is a bit more complicated, it’s also more subjective to the person who’s using it. If your mix is muddy, it’s just muddy in general to everybody most of the time. If it’s muddy, there are a few ways to fix that, but it revolves around cleaning up the low-mid area. Compression is highly subjective, and you can use it so many different ways. You can use compression five different ways that all sound different but still GOOD. It just depends on the style you’re going for, and the sound you want out of your mix. You’ve probably heard that professional mixing engineers use compression when they mix. Understanding what a compressor does and when you should use it might give you a clearer insight into why you should compress your tracks and how to go about it. What Does a Compression Do? In the simplest of terms, it’s a level controller. It makes the softer signals louder and the louder signals softer. It manages your signal for you, raising it and lowering it depending on how loud it is. But using compression and knowing how to compress are two different things. It comes down to the mentality of using compression as a tool, not as a crutch. So instead of slapping a compressor plug-in on each track because that’s how you think it’s done ask yourself what the end goal of using the compressor is going to be. Do you need to tighten the drums? Do you need to level the vocals? Do you need to tame the attack of the transients? All of these questions have different compression answers depending on what you’re trying to accomplish. So when things are nicely balanced, and EQ’d, the thing you reach for next is the compressor. Only this time you should ask yourself why you’re doing it and then try to accomplish those goals. Once you know that you can start playing with your toys. What Do All Those Knobs Do? Let’s talk about the knobs you’ll find on your compressor. First off, let’s talk about the threshold and the ratio. Threshold – The threshold sets the level for where the compressor should start listening to the audio signal. If the audio is very low in level and the threshold is too high, it won’t hear the signal, so it will effectively be useless. Any other parameter doesn’t matter because the compressor doesn’t start working until the audio hits the threshold. Ratio – This is the “amount of compression.” So if you have a specific level go over the threshold and the ratio is 2:1 then it will divide the amount that goes over the threshold in half and compress it down by two. So the higher the ratio, the more extreme the compression. 10:1 and higher is usually called limiting because any signal over the threshold gets compressed so hard that it gets pushed down to where the threshold sits instead of letting some of it through. Further Reading: What Does the Ratio of Your Compressor Really Do? Ok, so basically these two parameters work in tandem. Many compressors only have these parameters and nothing else. Use them when you want to give your track its specific character and color. But since we want to know how everything works let’s check out the next set of knobs here, the attack and release. Attack – This is the amount of time you give the compressor before it reacts to the incoming signal after it reaches the threshold. If the attack is fast, it’ll compress immediately after reaching the threshold. If the attack is slower, it will take a minute to react. Picking the right attack time is crucial for shaping sounds because it can change the way the transients of the audio signal is affected. Release – This is the opposite. It’s the time it takes for the compressor to stop compressing. Faster release times means faster recovery time for the compressor. Longer release times means it keeps the signal compressed for longer, which can result in pumping with very rhythmic signals because the audio is never allowed to go back to its initial uncompressed audio. Those four parameters are usually the most important ones to keep in mind on any compressor. Knee – Whether you select a soft or hard knee will change the way the compression is applied, either gradually as the signal approaches the threshold, or linearly as soon as the audio hits the threshold. Input/Output and Make-Up Gain – This is important for gain staging purposes and obviously changes according to the level of the signal you’re feeding into the compressor. If you have a very quiet signal you might need to increase the gain so that the compressor works better (or down if you can’t put the threshold low enough and it’s always compressing way too much). A good rule of thumb is to increase the output according to the same amount you’re compressing, either by using the output knob or the make-up gain. Also, whenever you’re compressing make sure that you don’t get extreme level differences when you bypass the compressor because it’ll make you think everything sounds better when it just sounds louder. Dry Mix – If your compressor has a dry mix knob you can add in a bit of the uncompressed signal which can come in handy if you want to do direct parallel compression without using sends and busses. Metering window – The window is convenient for seeing the waveform on the screen, what the compressor is doing to the signal and for seeing how much gain reduction is going on. A compressor is a compressor is a compressor right? There are multiple types of compressor types that all sound different. Sometimes, you might not even realize the amount of different sounds you can squeeze out of your compressor. If we just talk about the software side, excluding any outboard compressors you might have, then the typical DAW compressor has a few different settings that you should experiment with. I’m not talking about all those buttons you know all too well. I’m talking about the compressor models. Depending on the style of music and instrument you’re running through the compressor, these styles will change the way the compressor works on your audio, so it’s worth it to experiment a bit until you find what the style you like the most. FET – Any plug-in that emulates a FET(Field Effect Transistor) is emulating an 1176. The 1176 is perhaps the most famous FET compressor. People like to use them to get punchy drums. Opto – The LA2A is an optical compressor. It works a little slower and doesn’t react as quickly to your audio. It works well for parallel compression if you don’t want an aggressive attack/release. VCA – Fast and transparent. The VCA model doesn’t color the sound as much as the other models, so they’re ideal when you want your compression to go unnoticed. Some compressor plug-ins have more types, but these three are the most common. Compressors tend to build upon these models. There are different emulations, but these are the most common and popular out there. They have a particular sound or character that’s different from generic, stock models. So it’s no surprise that an LA2A sounds different than an 1176 in your mix. Their “circuitry” is completely different. That’s why many all-in-one compressors have a “type” button that allows you to change the character of the compressor. With certain compressor plug-ins, you can switch between a few different emulations. Whether it’s the standard Logic Platinum model or their FET, VCA or Opto emulations, all of them give various results and color the sounds differently. In Logic, for instance, they are all based on famous models, like the 1176(FET) or LA2A(Opto) and although they might not sound exactly like their more expensive counterparts they do behave similarly. So when your favorite producer says that he always likes to put his drums through a 1176, you can easily get close to that same sound. Try to see if bussing your drums through a compressor set to a FET setting will produce something similar to what you hear in your head. These models are designed differently, and they all have a different sound. Don’t just stick to the generic type your DAW defaults to. Use those different models to get a diverse sound in your mixes. Slapping the same model across the board might work if you just want generic compression. But it’s uninteresting and boring. Use these different models next time to create interest in your mixes. Deciding which compressor style to use doesn’t have only one right answer. You might be using compression for different things on the same track. That’s the beauty of these different compression styles. They work especially well together because they’re different. For instance, you can decide that you need to use a fast, FET compressor to tame the peaks of the signal. Use a low threshold so that it only reacts to the peaks. Use a high ratio so that those peaks will be cut down effectively. Use a fast attack and release, so it reacts immediately to the peaks but resets just as quickly so it doesn’t affect the rest of the audio. But afterward, you might still want to thicken up the track or control the levels even further. Then you can add a second compressor in series after your FET compressor. That’s when an Opto style LA2A model comes in handy here because it’s slow to react and doesn’t make your signal sound overly compressed. You use that compressor on the overall signal to tighten things up. That way you’ve used two different compressor models to accomplish two very different things. But together, they create a better track than either of them could’ve done on their own. Try it out on overly dynamic vocal phrases, irregular guitar performances or inconsistent drummers. Let me tell you how to approach compression by telling you a little story about gambling at a Vegas Blackjack table. I’m not a high-roller, but I do like gambling. Especially at games like Blackjack where you have a system and don’t just rely on blind luck. Blackjack is a great game to play if you know how to play by the book. You can play for hours if you just follow the simplest of systems. For instance, if the dealer has a 5 and I have a 12, then I stay and don’t ask for another card. There’s a higher probability of him busting, so I’ll stand my ground and hope the probability plays out. You always hope the dealer busts, and when he has a low card, there’s a higher chance of him losing. I also always hit on 16 whenever the dealer has a 7 or higher. You always assume that the dealer’s other card is a 10, so by default you’ve lost. But if you hit and get anywhere from an Ace to a five you’re better off. I’d rather hit and lose than wait and lose anyway. And finally, always split into Aces and eights and double down on 10’s and 11’s if you’re higher than the dealer. It’s a system. A system is a set of guidelines and rules that I’ve memorized. It’s actually a pretty great system that works most of the time. You don’t always win, but you can end up playing for a long time without losing any money. Using compression works the same way. Just like in Blackjack, the system I use with compression has a greater probability of working, so I stick to it and tweak as needed. I follow my go-to presets in my head whenever I’m mixing. A kick drum starts with a ratio of 4:1, a gain reduction of 3-6 dB and a medium attack and release. With just a few tweaks from there, I’m able to get the sound I want. Bass guitars start with the ratio relatively high, the attack fairly fast and more gain reduction than other instruments just to get it fat and steady. Sometimes that works well, but other times I need to move things around to get the bass to sound right. And finally, I always parallel compress the drums and shape the snare compressor in time with the track. Just like doubling down on 11 is the smartest move when you find yourself playing Blackjack, so is buss compressing the drums. It just works 90% of the time (it actually doesn’t work 90% of the time to double down on 11s, but you catch my drift). However, for drums, if you want that punchy drum sound without overpowering the rest of the mix, that’s the way to go. There’s a system for everything, including compression. My system helps me work faster since I know from experience what usually works. Given a good starting point, a great result is just a few tweaks away. 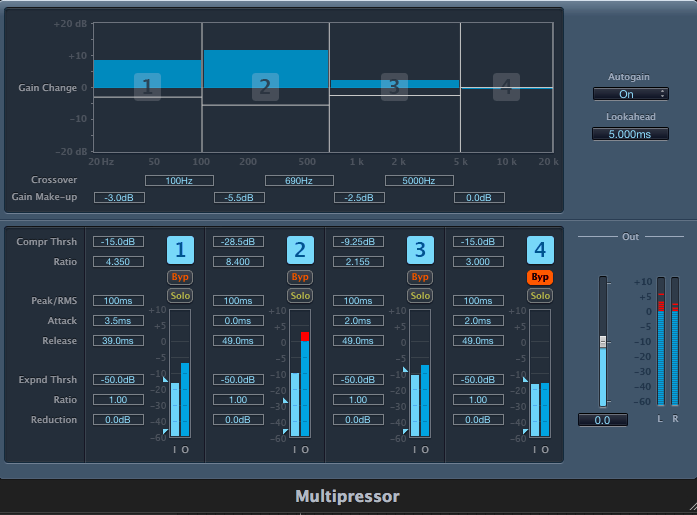 Are You Scared of Using the Multi-Band Compressor? There’s one processor that’s both incredibly useful and scary intimidating at the same time. I was afraid of using it for the longest time because I wasn’t sure how to work it correctly. So I just kept on using my other compressors, not realizing the potential I was passing over. I always use to use them in mastering, but that somehow seemed easier and more straightforward. It wasn’t until I realized the problem-solving capabilities of the multi-band compressor that I finally got hooked. On the master bus. Getting a great mix from the top-down with multi-band compression lets me dial in the right compression in the right frequency ranges. To tame muddy bass guitars. I sometimes slap a multi-band compressor on a bass and compress a little harder on the low-mids to get the bass to sit better in the mix without adding too much boominess. On the drum bus. A multi-band compressor lets you compress the entire drum-kit at varying levels throughout the entire frequency spectrum. This is great when you need to hit the kick pretty hard in the low-end but don’t want the cymbals to constantly compress every time the kick hits. I discuss this in detail in my post, How to Make Your Drums More Powerful With Multi-band Compression. Smoothing out vocals. If you find a specific frequency in the vocal that’s causing problems just tweak the crossover points of the multi-band compressor so that it’s taming that particular frequency range while leaving the rest of the vocal alone. The multi-band compressor is a seriously useful tool to make better mixes. These are only a few of the ways I’ve been using it lately. The guys over at The Pro Audio Files realized how valuable it is for you to know how to use it, so they’ve created a brand-new workshop all about the multi-band compressor. Check out the multi-band compression workshop right here. Congratulations on getting this far. Reading a 4,000+ word article on the internet? That takes dedication. I hope you’ve learned a lot about compression so far, but I understand that applying it in your mixes can still be confusing. A reader wrote in with a few questions about using compression for both mixing and mastering. That’s why I thought I’d answer a few common compression questions I’ve gotten throughout the years. Feel free to add more in the comments. It is said that you do compression after the mix. Don’t you compress during the mix like on individual instruments e.g. drums, bass etc? Absolutely. Compression is the best way to control dynamics and keep some instruments in check while making other elements of the mix tighter and more powerful. I compress each instrument, and I also use bus compression and parallel compression together. Do you compress like a pre compression before you send it for mastering? If you’re sending it to a good mastering engineer to get it professionally mastered, you can leave all your compression off the master bus. However, compression on individual tracks is crucial to creating a good mix. Using compression on the master bus is sometimes done when you want to get a taste of how your mix will sound mastered. But once you send that mix to mastering, take that stuff off and don’t even think about limiting. I will add that I tend to mix into a compressor on my mix buss because it makes the entire song sound tighter and more glued together that way. If I do my dirty mastering on the master buss, I’ll leave it on. If I send it to a mastering engineer, I usually give them two versions, one without the master bus processing and one with. What instruments do you compress yourself during the mix? I will usually compress all of them. You can also ride the automation and manually manage the level of the tracks if you don’t want to compress every track but I’m too lazy for that. If you compress using a multiband compressor on many instruments, knowing that you can even adjust bass and treble within the bands, won’t it already come out quite clean and neat already? Multiband compression is a lot more complicated than that. The great thing about multiband compression is that you can target specific frequency ranges of instruments. This is great when you have instruments that have a wide frequency range if you need to only compress certain aspects of that instrument. Ian Shepherd tells it better than me in his Mastering With Multiband Compression series. It’s useful even if you don’t do any mastering. Why do you need to send a song to mastering? There might be already much treble and sheen etc on the music. It might not sound dull anymore after the mix, or are you to make it sound dull so the mastering engineer can pump it up? Make the best mix you can. Sometimes a great mix needs minimal changes, and if you’re only making single songs, you might be okay adding some compression, limiting and EQ on the master bus and calling it a day. But if you’re mastering together a compilation of songs you’ll need to master them together so that they all sound like an album. Otherwise, you’ll end up with a collection of songs at different levels that sound sonically distinct from each other. One might be louder; another might be brighter and third might be much quieter. Making the songs sound like they belong together on an album is the purpose of mastering. So how far can I go with the mix and applying compression to the instruments before hand? As far as you think it sounds good, and you’re not audibly squashing the audio without a purpose. Memorize the material I’ve talked about in this guide to use compression to bring out the best of your instruments in the mix. If you want some additional ideas, here are ten different things you can do when you’re using compression to make your mixes better. Tame Drums – If the drums are getting in your way, careful attack and release timing can tame some of those pesky transients to make for easier-sounding drums in the background. Explode Drums – On the other hand, if you want them to explode, parallel compression can make your drums big and juicy. Take care of lousy bass players – Inexperienced bass players can be all over the place. Using the threshold and ratio to control their dynamics so that their notes don’t pop out all over the place is a great way to use compression. Make the rhythm guitar pop – Compression on tight and strummy rhythmic guitars can fatten up the guitar tracks and make it pop. Smooth out lead guitar dynamics – If you have long lead lines soloing in the background, long releases can make your solos sustain even longer. You might even go grab a cup of tea, and it’ll be like “wheeee” when you come back. If you didn’t get that reference, watch Spinal Tap. Side-chain compress for automatic dynamics – Side-chaining the bass to the kick drum can give both of them space in the mix. The same goes for the vocal and a busy guitar part. Make the room sound bigger and punchier – Compressing room mics can make your drum sound even more explosive. This, combined with parallel compression can make your drum sound real fat. Bring out the intricacies of the vocal – A juicy valve compressor, even just an emulator, can bring out the little intricacies and nuances of the vocal. Compressing to retain dynamics while bringing out the emotion is the key to a well compressed vocal. Keep the reverb at bay – Since compression is an automatic volume leveler, using compression on effects such as reverb can help. How to Make Your Tracks Sound Great WITHOUT Using Compression?!? If you think all that information is too much, don’t worry, you don’t really need to know how to compress. Especially if you’re happy with your source sounds. I mean it, don’t worry about it. You can achieve something similar without compression, just with a little more work. Some of you might think I’m crazy. You DON’T have to use compression?!? If a compressor is just a level controller, then there’s something else you can do. Make the softer parts louder by pushing the levels up yourself. Similarly, lower the volume of your track when it gets too loud. Sure, it might take a while to do, but it’s the trade-off to not learning how to compress correctly. Normally, automation is the last step in making a mix sound good. It’s where you take all the elements and automate certain parts so that they pop out in certain areas, or blend in with others. Lower the level of the rhythmic guitar during a solo section. Increase the level of the overall mix during a chorus. Mute reverbs during breakdowns to create contrast. Automate panning on delays so that they come from different spots in the stereo spectrum. Automation can create a more dynamic mix if you approach it the right way. And yes, you could even use it instead of a compressor. It just takes more time and effort. Using compression is just the easier way to go. It takes less time to learn how to effectively use a compressor instead spending hours automating to get the same effect. Automation is a great way to enhance a mix, but don’t take the long way home just because you’re intimidated with using compression. EQ and compression are you best friends for making better sounding mixes. They go hand in hand to create separation between your instruments and punchy and tight dynamics in your tracks. Learn what all the buttons on your compressor do, experiment with the different compressor styles and then start applying the aforementioned compression tricks in your mixes. The next step you should take is to grab my 10-step process to get your songs to sound awesome on any speaker without needing to buy any more gear. Click here to get the Mix Translation Sheet.